I am new to Teen Science Cafés. I heard about them through a Craig’s List notice in August of 2013 and jumped at the chance to help start a new site in Taos, New Mexico as part of the Café Scientifique New Mexico program. Taos is a small village of ~5000 people in rural northern New Mexico. The Taos Café follows a format that has been structured and improved upon over seven years of pioneering work by the team in New Mexico. What I added to the team is my bioscience background and sales experience which allowed me to establish the program as quickly and broadly as possible. Community support is key to the success and sustainability of all Teen Cafés . Site coordinators will come and go, youth leaders will turn over, and the program will evolve. Long-term success will ride, to a great extent, on the community’s endorsement of the program’s distinct and inherent value. So, it seemed keenly important to establish our presence and value to the community leaders, businesses, and parents. 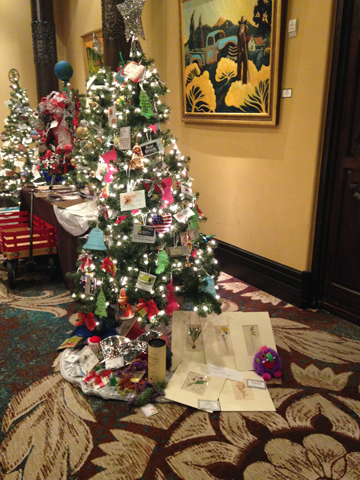 “The Festival of Trees” is an annual Taos charity event. Businesses donate a holiday tree in the name of a non-profit, which is decorated and auctioned silently at a community party in an upscale resort hotel. This year over forty non-profits were represented and total proceeds exceeded $35,000. My goal in participating in this charity event was to raise broad awareness of the program and its value in the community first, and to raise some extra funding to allow our youth leaders to expand on the kinds of activities we could support, such as field trips. We decided to make the Café Scientifique tree distinct and demanding of attention. My plan was to increase the value of the tree by gaining donations of attractive decorations, gift certificates, and unique gifts for under the tree. I engaged youth leaders by asking each to commit to approach three local businesses. Most youth leaders were successful in receiving at least one donation. To further our cause, one of our leaders wrote a story for the Taos News about Café Scientifique’s involvement in the fundraiser. We spoke with a wide variety of businesses, over 65 total and received 48 donations. 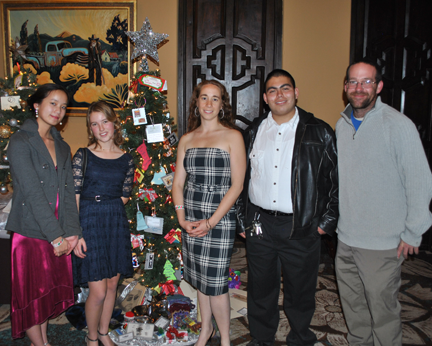 Our tree was valued at just over $3,000 and auctioned for $850. (Next time we will split the goodies between two trees). The youth leaders and I have decided to spend the money on projects that allow them to take further ownership of the program. 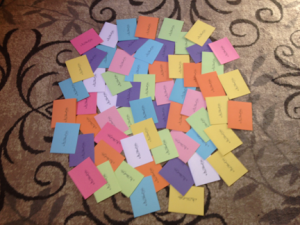 And, even better, we met the goal of getting our name out. To “sell” the Café Scientifique program concept, we communicated three invaluable aspects of the program: 1) It gives area teens an opportunity to engage with their peers in a safe, free and educational setting. 2) Teens learn what science is from cutting-edge scientists. 3) Teens are encouraged to develop and practice leadership skills. It’s a no brainer for community leaders to support. Thank you notes to the awesome donors! Since the fundraiser, the Kit Carson Electric Cooperative in Taos has invited us to submit a proposal for funding and the Rotary Club is considering offering a scholarship to a youth leader. The support of the community has been incredibly energizing to the youth leaders and myself. What did I learn from this adventure? Know and trust the incredible value of these programs and the youth leadership, without hesitation. Communicate and demonstrate it as often as possible. Keep things simple and the rest will most often work itself out.